Anuyoga (Skt. ; Tib. རྗེས་སུ་རྣལ་འབྱོར་གྱི་ཐེག་པ་, Wyl. rjes su rnal 'byor; Eng. 'subsequent yoga') — the second of the three yanas of powerful transformative methods specific to the Nyingma school. Anuyoga focuses mainly on the completion stage (Tib. dzogrim), and emphasizes the inner yoga of channels, winds-energies and essences (Tib. tsa lung tiklé). Visualization of the deities is generated instantly, rather than through a gradual process as in Mahayoga. The vehicle of Anuyoga , or ‘following yoga’, is so-called because it mainly teaches the path of passionately pursuing (or ‘following’) wisdom, in the realization that all phenomena are the creative expression of the indivisible unity of absolute space and primordial wisdom. One’s mind is matured through the thirty-six empowerments in which the four rivers—outer, inner, accomplishing and secret—are complete, and one keeps the samayas as described in the texts. Through logical reasoning one determines that which is to be known, the fact that all phenomena are characterized as being the three mandalas in their fundamental nature, and realizes that this is so. Meditation practice here consists of two paths. On the path of liberation one practises the non-conceptual samadhi of simply resting in a state that accords with the essence of reality itself, and the conceptual samadhi of deity practice, in which one visualizes the mandala of supporting palace and supported deities simply by reciting the mantra of generation. On the path of skilful means one generates the wisdom of bliss and emptiness through the practices of the upper and lower gateways. One practises the conduct that is beyond adopting or abandoning in the recognition that all perceptions are but the display of the wisdom of great bliss. 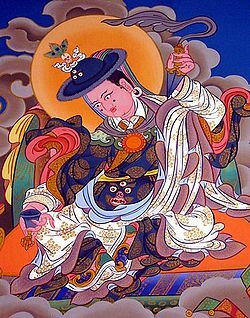 At the culmination of Anuyoga’s own uncommon five yogas, which are essentially its five paths, and the ten stages that are included within these five, one attains the level of Samantabhadra. King Dza, who also received the Mahayoga tantras, received the Anuyoga tantras from Vajrapani and Licchavi Vimalakirti—one of the Five Excellent Ones of Sublime Nobility who received the Anuyoga tantras from Vajrapani at the summit of Mount Malaya. They were in turn transmitted to the siddha Kukkuraja, and then passed to Nupchen Sangyé Yeshé who taught them in Tibet. ↑ The sutras of Anuyoga are different from the shravaka, pratyekabuddha and bodhisattva sutras. ↑ P. Cornu says that this tantra is an explanation of the first one. Somehow it seems that these first two root tantras are sometimes amalgamated or confused together in modern sources. ↑ This needs to be checked and developed. Dudjom Rinpoche, The Nyingma School of Tibetan Buddhism, Its Fundamentals and History, trans. and ed. Gyurme Dorje (Boston: Wisdom Publications, 1991), Book One, Part Four, Ch. 6 'Anuyoga', pages 284-289 & Book Two. Jamgön Kongtrul, The Treasury of Knowledge, Book Six, Part Four: Systems of Buddhist Tantra, translated by Elio Guarisco and Ingrid McLeod (Ithaca: Snow Lion, 2005), pages 330-337. Khenchen Palden Sherab Rinpoche & Khenpo Tsewang Dongyal Rinpoche, Key to Opening the Wisdom Door of Anuyoga (Padma Samye Ling Shedra Series), (Dharma Samudra, 2015). Patrul Rinpoche, The Words of My Perfect Teacher, translated by Padmakara Translation Group (Boston: Shambhala, 1998), pages 334-335. Tulku Thondup, Masters of Meditation and Miracles, edited by Harold Talbott (Boston: Shambhala, 1999), pages 28-29. This page was last edited on 2 September 2015, at 08:54.